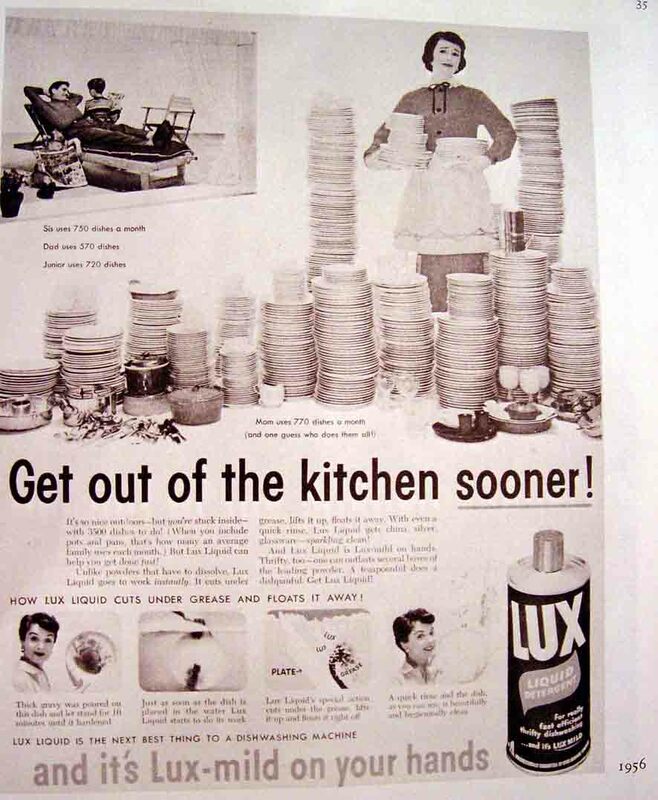 Below is an advertisement from 1956 for Lux liquid detergent. It depicts an overwhelmed wife and mother, surrounded by piles of dirty dishes and tableware. The father, however, is shown in the top left corner reclining and relaxing, with a happy smile as he enjoys leisure time after a hard day’s work. This snapshot in time illustrates how, like the many women before her, a mother’s sole responsibility was the household and everything in it, including cooking, and cleaning. On the surface, it seems that women have come a long way since this advertisement was published. The Bureau of Labor Statistics reports that only 27% of mothers with children under 18 were part of the 1955 labor force; this number more than doubles to 71% in 2013. Today’s mother is modern and a transformation from her 1950s ancestor; she works, she drives, she plans, she wears pants (gasp! ), and she manages the household budget. Now, would you be surprised to discover that in 2015, mom is still the one responsible for handling the majority of those 1950’s items? The Research Moms are, too. 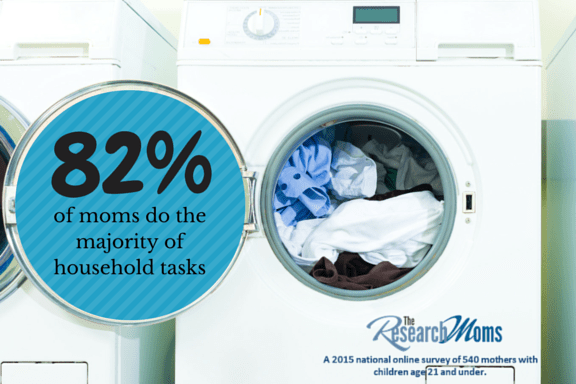 In a 2015 study of mothers with children age 21 and under, The Research Moms asked, “How do you and your family balance the household tasks?” A startling 82% of these mothers said they do the majority of the tasks, with more than a quarter (26%) handling all of the chores. This is in stark contrast with the 1% of mothers who say they aren’t involved at all with any of the household tasks. Only 16% reported sharing the tasks evenly with their family members. This isn’t to say that dads don’t contribute to the household. 2011 Pew Research data showed fathers of children under 18 spent an average of 10 hours a week on housework, compared to the 18 hours spent by mothers. The discrepancy, however, lies in the type of housework mothers and fathers undertake. Working Mother found in its 2015 study that mothers are mainly responsible for chores inside the household, such as dusting, cooking, and doing the laundry. Fathers, on the other hand, typically handle the outside tasks, such as car maintenance, mowing the lawn, and taking out the garbage. In the 1950s, gender roles were pretty well-defined. Mothers stayed home to cook and clean while their husbands were out working to provide for their families. One might assume that if gender roles blurred together and mothers worked like fathers did, then the household maintenance would be more evenly divided. Yes, one might assume this, but then again, one should remember what happens when one assumes. The Research Moms’ data shows a whopping 83% of today’s working mothers are still responsible for the majority of household chores, which is just as high as stay-at-home mothers. In fact, even 76% of breadwinner mothers, or moms who serve as the primary earner of the family, are not exempt from doing the majority of household duties. So while it’s true that mothers have only added to their list of responsibilities, it’s also true that they’ve been successful at it. They run corporate meetings, schedule playdates, organize school events and still make time to maintain the household. Today’s mothers have given new meaning to the word superhero, since not only are they bringing home the bacon but they are cooking it as well. The Research Moms conducted a national online survey of 540 mothers with children age 21 and under in 2015.